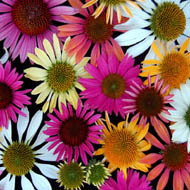 A tough, drought resistant groundcover with glossy, green leaves and 2" wide, daisy-like, bright-pink flowers with a white center. Flowers all summer. 4-6" ht. Z 5. Great compact plant with navy-blue flowers. 10-12" ht. Z 3-7. Native. Deciduous, erect-arching, yellow-green, lacy fronds growing 15-30" tall. Spreads by long-creeping rhizome. Provide room for this fern to spread. Tolerant of dry, thin or sandy soils. Z 3-8. Clump forming, cool season grass with dark-green, thin leaves and airy golden-yellow flowers during summer. Easy to grow in average to consistent moisture and sun to part sun conditions. 12-24" h x 24-30" w. Z 4-9. Clump forming, cool season grass with dark-green, thin leaves and airy golden-yellow flowers during summer. Easy to grow in average to consistent moisture and sun to part shade conditions. 12-24" h x 24-30" w. Z 4-9. Deciduous shrub with compact habit and fine texture. Gently arching branches are covered by panicles of white flowers during spring. Suitable for small gardens or cascading over a low wall. Burgundy fall foliage. 2' ht x 5' w. Z 5-8. Spicy fragrant, double flowers with frilly, white petals and a burgundy eye emerge during spring above a low cushion of grassy, grey-blue foliage. Long blooming plant. Provide sun and low to medium moisture. 8" h by 10" w. Z 5-9. Vivid red, single blooms in late spring cover the glaucous blue-green foliage. Compact, mounding habit to 6". Z 5-9. Compact habit with gray-green leaves. Prolific, fringed, 1" diameter, soft-pink flowers. 6-8" ht. Z 3-9. Long blooming, magenta flowers above deep blue-green foliage. 6" ht. Z 3-9. 2006 PPA Perennial Plant of the Year.